NEW questions are being raised over the actions of DUP ministers towards the Irish language while in government. Documents have emerged showing the extent to which Arlene Foster and her special adviser intervened in a policy row over Irish language tourism signs. It has also emerged that the outgoing DUP Communities Minister Paul Givan did not carry out a key government equality test before ordering a controversial cut to the Líofa Irish language scheme in December. Within weeks Mr Givan restored the £50,000 bursary scheme for individuals from disadvantaged backgrounds who wish to learn Irish, saying he did so because he did not want Sinn Féin using it as a “political weapon”, though the absence of an equality screening assessment has now been confirmed. Meanwhile, former First Minister Arlene Foster has been linked to an Irish language row, as has her former ministerial adviser Andrew Crawford, who recently resigned over the Renewable Heat Incentive (RHI) scandal. 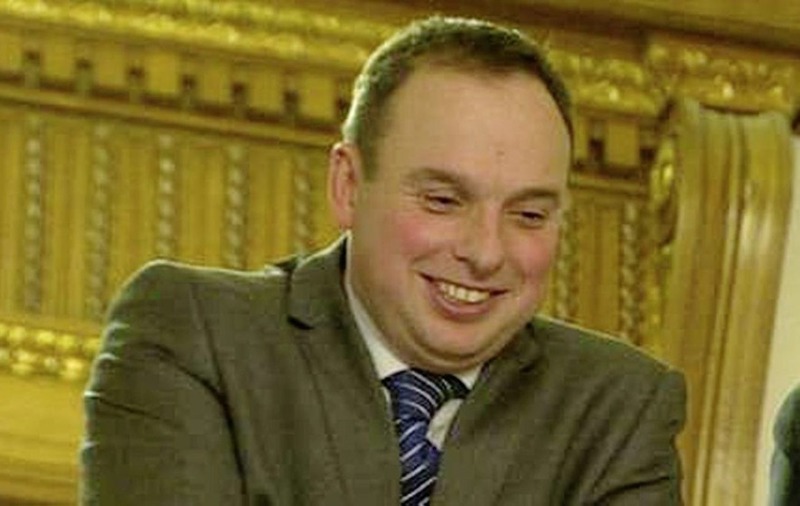 They are shown to have intervened in requests for Irish language tourism signs from two local councils while Mrs Foster was at the helm of the Department of Enterprise, Trade and Investment (DETI), advising the Northern Ireland Tourist Board (NITB) to refuse to fund the signs and adhere instead to its policy on using English. The information on both issues was secured by civil liberties group, the Committee on the Administration of Justice (CAJ) and comes as equality issues are central to the political crisis that has forced the collapse of the Stormont Assembly. The dispute over Irish language signs stemmed from plans by Down District Council and Newry and Mourne District Council to erect bilingual tourism information panels along St Patrick’s Christian Heritage Trail. In 2010 both councils sought to erect signs in both English and Irish along the route of the signature tourism project. The signs were to be funded by the then Northern Ireland Tourist Board (NITB). The board, however, subsequently ruled out the possibility of funding bilingual signage and cited a policy for ‘English only’ signs, except where an attraction was already named and known in the Irish language. 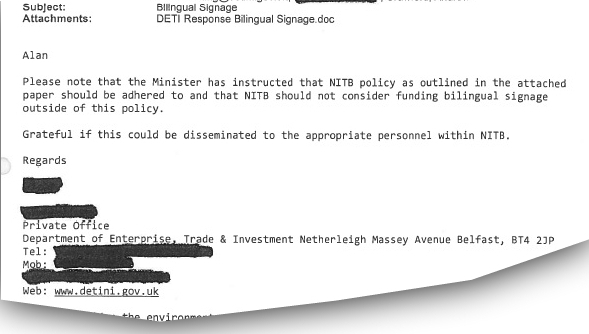 Documents show that Mrs Foster, who was DETI minister at the time with responsibility for tourism, became involved in correspondence with the NITB over the dispute. 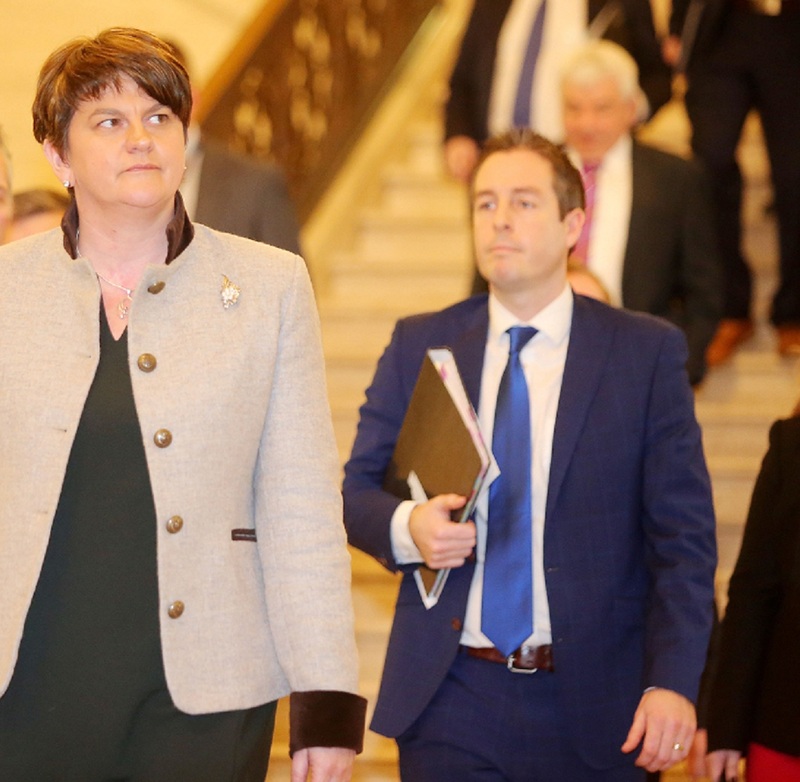 The DUP denied there was any controversy in her involvement and told The Detail: "The signage in question was funded by the Northern Ireland Tourist Board and Arlene Foster, as the Minister, instructed that NITB policy should be adhered to." But documentation obtained by CAJ after a lengthy Freedom of Information challenge against NITB has shed fresh light on the language row. Extensive correspondence between DETI officials and the tourist board includes emails from Minister Foster’s DETI office and her special adviser, Andrew Crawford. On December 23, 2010, Mr Crawford sent an email to Mrs Foster and a second individual whose name has been redacted. Mr Crawford wrote: “At Monday night’s meeting of Down council a long debate took place regarding signs for 14 locations on what is known as the St Patrick’s Trail. An email sent by Andrew Crawford to DUP leader Arlene Foster. The identity of the second person in receipt of the email was withheld so it is unclear if it was sent to a department official or to someone in NITB, or elsewhere. 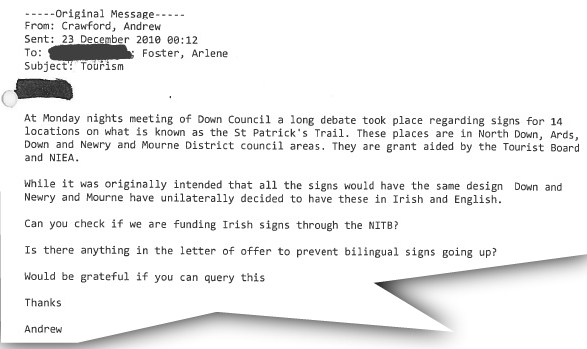 But a subsequent letter written by the Tourist Board refers to “a request from Andrew Crawford in December 2010 about whether NITB was funding Irish signs”. Three weeks after Mr Crawford’s email of December 2010, a further email was sent from Mrs Foster's office by her Private Secretary. The correspondence dated January 11, 2011, was sent to the then NITB chief executive and copied to her special advisor Andrew Crawford, the Permanent Secretary, Deputy Secretary, and another DETI official. An email sent from Arlene Foster's office when she was DETI Minister. The attachment to the email recounted the dispute with the councils and signalled that NITB’s language policy was drawn from an agreement around the use of language on road signs. NITB’s policy stance, however, came under the spotlight two months later when the Committee on the Administration of Justice sought clarification from the tourism board on the “basis, scope and lawfulness” of what the civil liberties group described as a “largely unwritten policy”. Over the next year the CAJ queries were followed by considerable correspondence between the tourism board and DETI over the policy wrangle. That correspondence has now also been released and shows how the department and the tourist board debated which of them had taken the lead on the policy decision. A letter from NITB in October 2012 stated: “NITB received a Departmental direction on this issue on 13th September as follows `The Department considers that NITB should respond along the lines of the approach outlined in point (i) - [Do not formalise a policy, but stand over the current approach. This could involve the inclusion of a Human Rights Impact Assessment proforma into the current Equality Screening procedures going forward;]. The word ‘following’ referred to an additional section of the letter that recounted the history of the signage row, stated a desire for signage that is `clear, not confusing’, and repeated the convention where road signs were in English unless an attraction was already known by an Irish name. Following questions from The Detail, the Department of Economy repeated that no ministerial and departmental directions were issued. The CAJ, however, called for further clarification. The CAJ’s Daniel Holder said: “The paper trail shows both the board and department sought to pass the buck to each other with the Board insisting it had received a Ministerial Direction and DETI insisting it had not. In 2014 a Council of Europe Committee of Experts on the European Charter of regional and minority languages subsequently raised concerns over the policy position taken in Northern Ireland on bilingual signage. In a report in January 2014 the Committee of Experts on the Charter urged authorities in Northern Ireland “to provide concrete and detailed information regarding the reported decisions by the DRD (Department of Regional Development) Minister not to introduce bilingual signage, and the refusal of the Tourist Board to do so, which appear to be an infringement of the Charter”. Since then a new policy on signage at tourist attractions and facilities was introduced for the first time in October 2014. The policy was agreed by Transport NI (previously known as Roads Service), Tourism NI (formerly NITB), and DETI. There is no mention of language provisions in the policy. Tourism NI failed to respond to a series of questions on the policy issue and whether there are language provisions for tourism signage. The Department of Economy, which is responsible for tourism, also failed to clarify the current policy position. On March 23, 2015, Sinn Féin MLA Caitríona Ruane tabled an Assembly Question on NITB legal fees over “challenges which were made against their decision to fund English only signage in the Downpatrick area”. 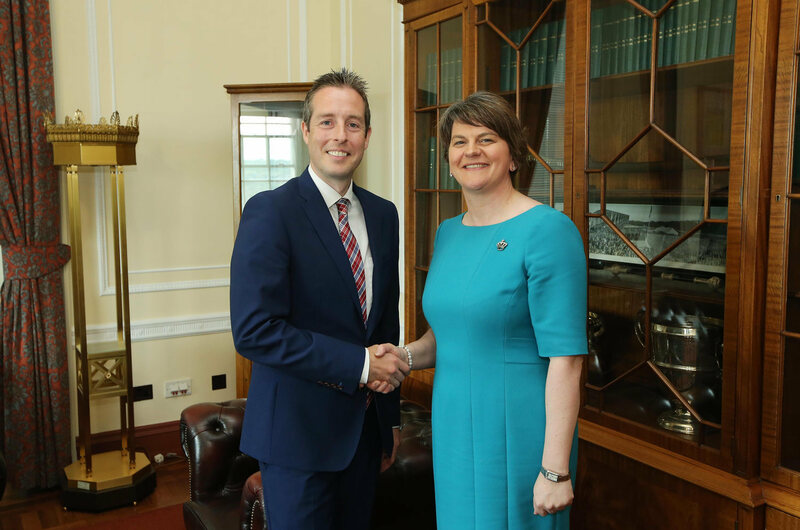 DUP leader Arlene Foster and Comunities Minister Paul Givan. Two days before Christmas DUP Communities Minister Paul Givan confirmed the withdrawal of a £50,000 grant scheme which allowed people from disadvantaged backgrounds to attend summer lessons at Gaeltacht areas of Donegal where Irish is the main language spoken. The decision drew widespread criticism and three weeks later Mr Givan u-turned on the plan to close the Líofa Gaeltacht Bursary Scheme and said he had “identified the necessary funding to advance the scheme”. Mr Givan announced his discovery of new funding on Twitter and later denied that the original decision had been politically-motivated. Communities Minister Paul Givan's announced the reinstatement of the bursary on Twitter. 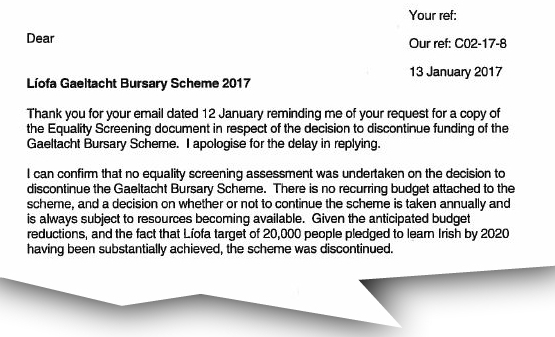 But now The Detail can reveal that the Department for Communities (DfC) failed to assess how closing the fund would affect the promotion of equal opportunities in Northern Ireland. The Department for Communities confirmed the failure in a letter to the CAJ dated January 13, 2017 which was the day after Mr Givan’s u-turn. It added: “There is no recurring budget attached to the scheme, and a decision on whether or not to continue the scheme is taken annually and is always subject to resources becoming available. The failure to complete an equality screening was confirmed in a letter to the CAJ. In a document published by the Department for Communities in May 2016 it stated it would carry out equality screening to assess the impact of any policy changes, referring to any “strategy, policy initiative or practice and/or decision”. A spokesperson for the Equality Commission for Northern Ireland said public bodies have a statutory duty to “have due regard to the need to promote equality of opportunity and regard the desirability of promoting good relations”. According to the commission an equality screening exercise is one of the tools a public body can use to ensure that they are meeting these obligations. Both the DUP and the Department of Communities declined to comment on the information being reported by The Detail. Click here to see coverage of this story by our sister publication Meon Eile.